As we all know, the experiences a child has during the first eight or so years of their life impact enormously on the kind of person they will become in the future. A significant proportion of this time is spent at school so it is crucial that we do absolutely everything we can to get things right. What do we mean by 'right'? Well, from an educational point of view, it's about creating an enabling environment and delivering a stimulating curriculum through which all children can become enthusiastic and highly competent learners. But we want more than just that. 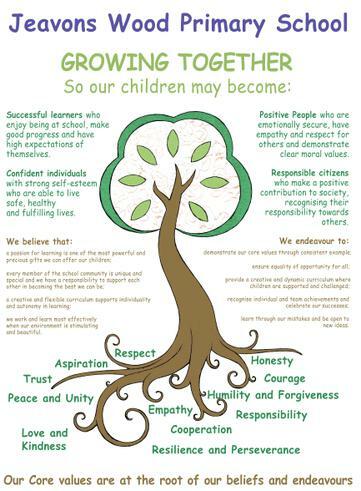 We want to ensure that our school is a place where everyone can experience a whole range of successes and where children are enabled to become confident individuals who are independent and creative in their thinking. We want to establish a climate of care and consideration in which children respect one another and enjoy learning about each other's achievements. We want to foster an ethos underpinned by strong moral values that will provide children with an exemplary model for living. The Jeavons Wood Value App An app developed by Harry, in Year 5, which provides advice, tips and videos for each value. The app runs on any device and doesn't require a download.